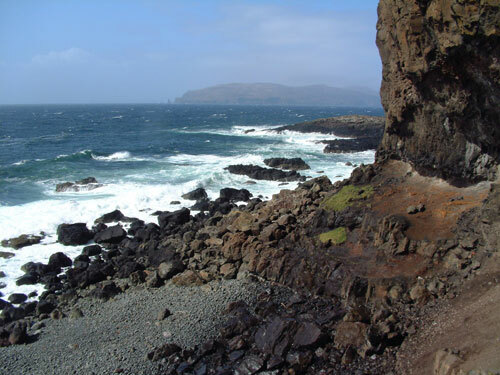 Martin and I have now finished the first phase of the excavations at the Fiskavaig rock shelter site for the 2009 fieldwork season. 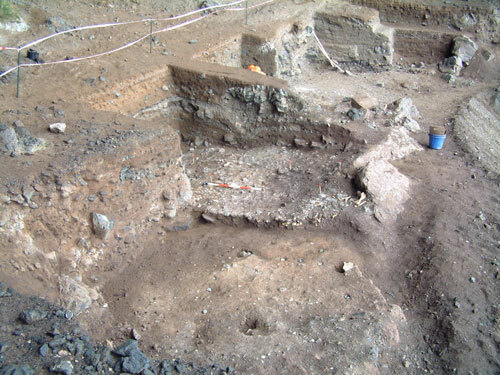 The main bulk of the work so far has involved removing the deep and sterile overburden deposits, probably in excess of 40 tons of material using picks and shovels, to reveal the top of the archaeological deposits comprising the period of final abandonment at the site. 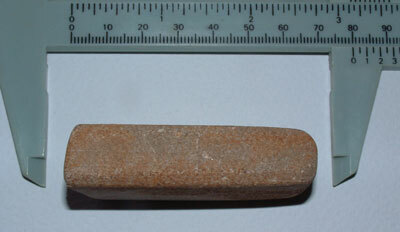 These deposits included shattered rock from the roof of the shelter, shellfish and some animal bone. 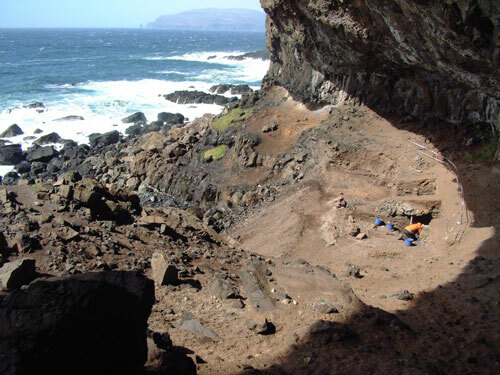 Below this we uncovered a more substantial layer of shattered rock and larger boulders representing roof failure at the site, below which we excavated through deposits of wind-blown sediments and silts containing the odd fragment of bone and some shellfish remains. The silty sediment directly overlies the upper portion of the main body of the midden, which comprises a dark-coloured organic deposit containing charcoal, fire-cracked pebbles and some ash cast out from the nearby hearth’s. Within the midden material are fragments of animal bone and in some areas of the trench, large quantities of shellfish including periwinkles and limpets. 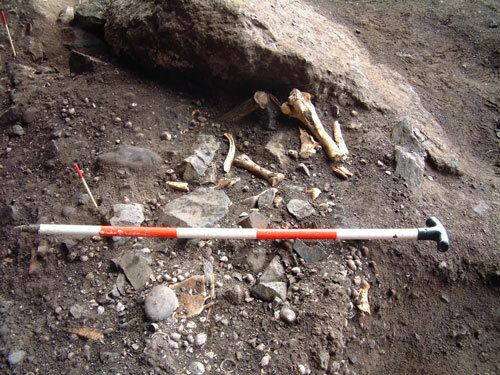 The image below shows the seaward-edge of Trench 3, in the northern half, with animal bone, red deer antler and shellfish laying up against one of the large boulders forming the base of the talus in this area that was inundated and washed away during the storms in 2005. 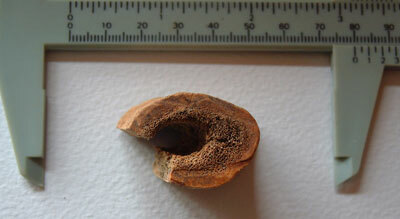 Some of the animal bone in the midden is semi-articulated, as can be seen in the image below showing the vertebrae of a large cow in section. 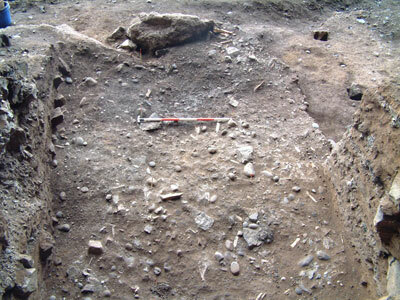 During earlier excavations at the site, within Trenches 1 and 2, we have uncovered well-built hearths that are contemporary with the formation of the midden deposits and we uncovered a new slab-built hearth partially located under the central baulk of Trench 3. 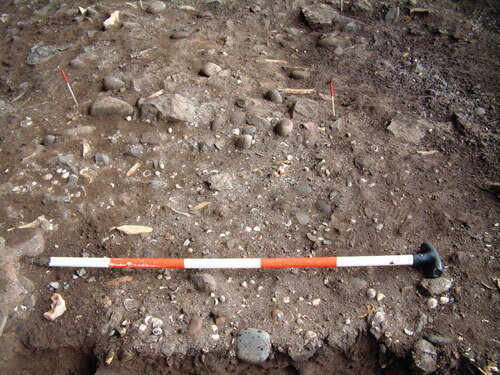 Deposits of orange and grey ash surround the hearth and significant quantities of fire-cracked pebbles are strewn across the surface of the midden that we have exposed, as can be seen in the image below. 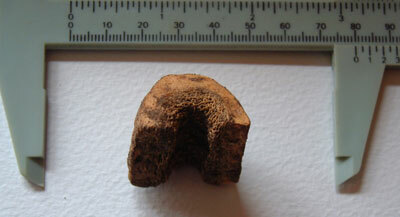 We have recovered a few small finds during the excavations including sherds of Iron Age pottery, including some rim and decorated fragments, part of a small whetstone, a fine bone needle, a degraded bone needle, some small bronze plate fragments, and several finds of worked red deer antler. 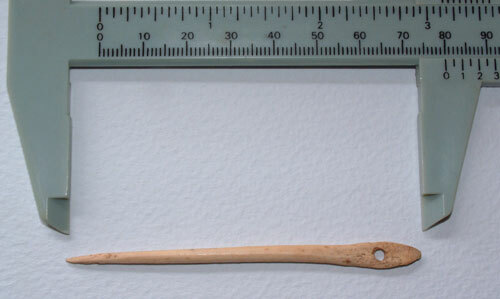 Many of these objects were found embedded in the top of the midden deposits, so this bodes well for more interesting finds within the main body of the midden, which varies in thickness from just a few centimetres in the southern half of the trench up to 30 centimetres in the northern half. The main body of the midden in this central area of the site appears to lie in a natural hollow within the rock shelter. 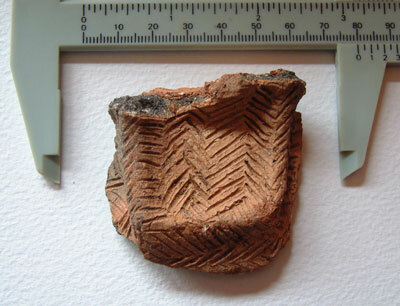 This fine sherd of decorated pottery, complete with a well-formed lug, was recovered from Trench 2. 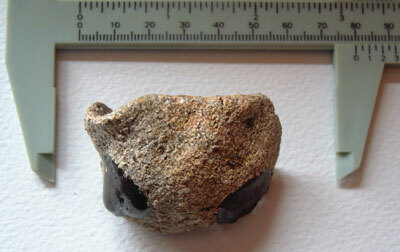 The decoration on this pot appears Neolithic in style, although the find was recovered from a secure Iron Age context. A trawl through various reference books has failed to identify a similar style of decoration and form from Iron Age assemblages in Scotland. We would of course be interested to hear from any visitors to the website who have seen this style of pottery - whether Iron Age or Neolithic! 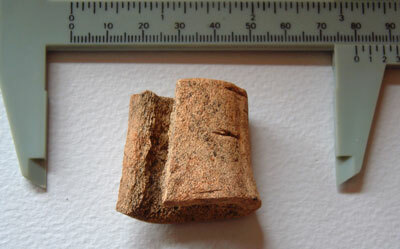 The two images below show a fragment from a ceramic crucible recovered from Trench 1 in the Autumn of 2008. 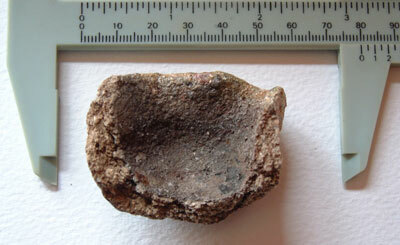 The crucible forms a part of a growing core of material relating to metalworking that was taking place at the site, including a mould fragment, vitrified clay lining from a hearth, slag deposits, bronze spatter, and a small bronze ingot. The trenches at the Fiskavaig site have now been covered over while we return to our excavations at the High Pasture Cave site. 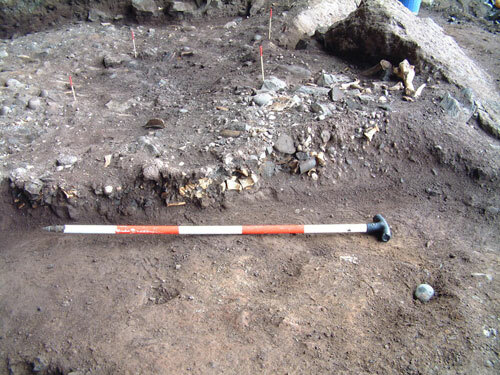 We will return to complete our excavations at Fiskavaig in late July/August, after which we will return to High Pasture Cave to finish our fieldwork for the 2009 season.